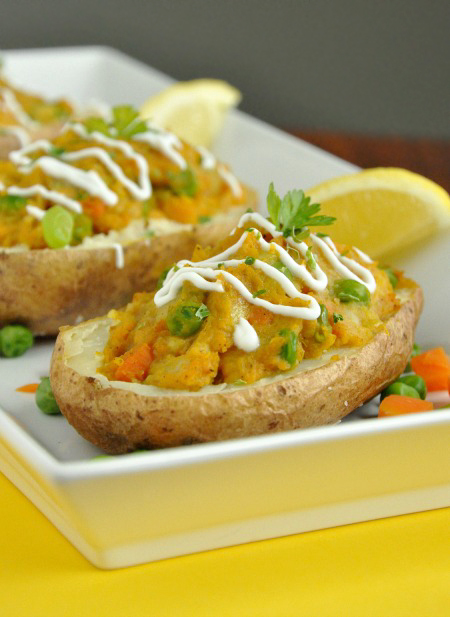 Veg things up for dinner with these crowd-pleasing Sweet Potato Samosa Stuffed Potato Skins! Today we’re mastering the fine art of vegetable inception. Hold on to your fork folks, because we’ll be experiencing a veggie, within a veggie, within a veggie. They said it couldn’t be done (okay no one actually said that) but we’re doing it! Samosas are typically little deep fried pockets filled with an array of Indian spices, potatoes, and peas. To amp up the health-factor, I’ve been stuffing samosa filling into baked potatoes and recently let sweet potatoes in on the fun. Whether you’re already a card-carrying member of team sweet potato or trying to sneak the veggie into your regular rotation of veggies, you’ll love this healthier samosa alternative! This delicious dish can be prepped and made ahead of time for a healthy and flavorful dinner and reheats fabulously as leftovers! Scrub and wash your potatoes and pierce a few times with a fork/knife. Rub each lightly with olive oil. Sprinkle skins with a pinch of salt and bake for an hour or until tender. Once they are done, slice in half and allow to cool. Need a shortcut? 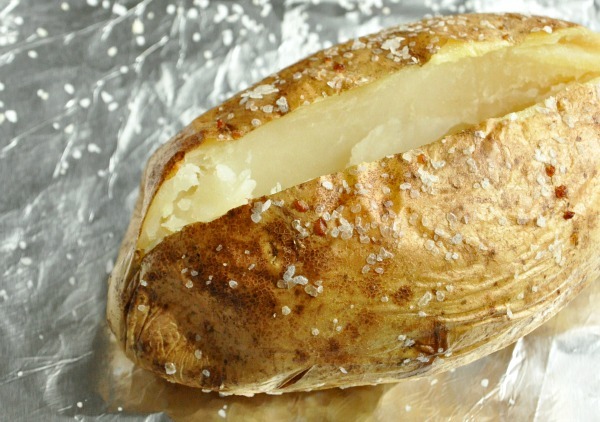 Wrap each potato in a slightly damp paper towel after piercing with a fork and microwave for 11 minutes. Rub with olive oil and sprinkle with salt and then bake until tender. This should cut your bake time in half and still give the skin of the russets a chance to get crispy. While the potatoes bake, tackle your prep-work. Saute your onions in a tablespoon of your favorite oil or butter along with your frozen peas and carrots. The carrots take the longest to cook so if you prefer super-soft carrots to ones with a bit of texture than start sauteeing those first before adding the peas and onions. One the sauteed veggies are tender and your onions are translucent, add in an extra splash of oil [if needed/desired], your minced garlic, and your herbs/spices. Stir in a cup of baked/microwaved sweet potato, stir, and set aside. Once your potatoes are cool enough to handle, gently remove the inside of the russet potatoes with a spoon or mellon baller, leaving a thin border (a few centimeters or so) of potato still in tact to maintain sturdiness. Spoon the insides into a bowl, add your veggie/chicken broth, and whip/mix. You can add a bit more if the potatoes seem dry. Next add in your sweet potato and veggie mixture and stir to incorporate. Taste test the filling and add any additional curry powder and spices your heart desires. I added extra garlic powder, cayenne pepper, and curry. 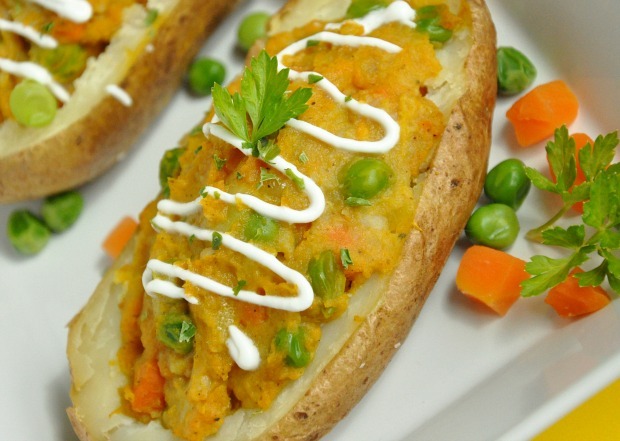 The sweet potatoes make the filling on the sweeter side of savory-sweet so if you like a kick - spice it up! Spoon the yummy potato-y goodness into the potato skins and bake at 350-400F for 20 minutes. Serve with lemon slices and optional yogurt or tzatziki sauce or nothing at at all. They taste great all three ways! You can be part of civilized society and dig in with a fork and knife or be a total foodie neanderthal like myself and eat it with your hands like a behemoth potato skin. It's yummy both ways... but I'm convinced my way is tastier! Feel free to add a little extra of the onion, peas, and/or carrots! Hooray veggies! Top with an optional but delicious dollop of Greek yogurt, sour cream, or thick and creamy tzatziki sauce and serve with fresh lemon wedges for a burst of refreshing citrus! It’s a delicious combo. Green onions are also fabulous on top of these! Ooh! And if you have any Indian spice blends on hand too, feel free to add it to the mix! brontosaurus chefs this one’s for you! vegansaurus chefs skip the greek yogurt topping and they’re gloriously vegan – a dollop of vegan sour cream would be great here! 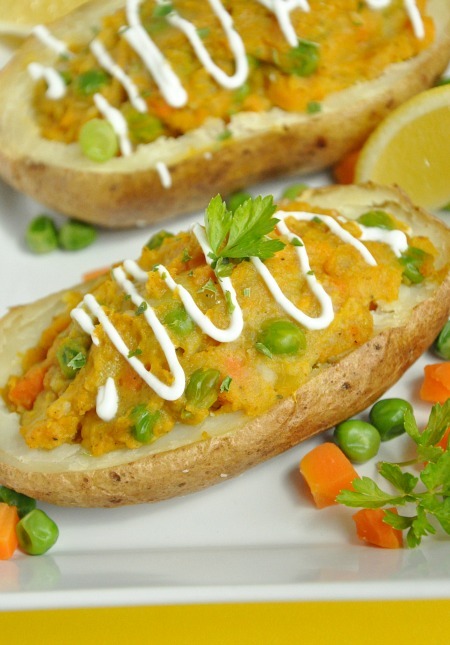 Whether you’re not a fan of white potatoes or only have sweet potatoes on hand, don’t stress it! You can absolutely make these with just sweet potatoes! The only difference is that the potato-skin portion of the dish won’t be as crispy and sturdy simply because sweet potatoes are softer and less starchy. No sweet potatoes handy? Make these. You can also cut them twice-baked potato style if you’d prefer, anything goes! Sweet, savory, and currylicious! The crispy skin of the russet potatoes makes the perfect vessel for this flavorful dish. You also have the added bonus of getting five different types of veggies in one handheld package, which beats the pants of a hot pocket any day of the week. I’ve been dreaming of curry potatoes for a few weeks now and this dish didn’t disappoint! They’re awesome the first day, and by act of foodie magic, even better the following day. In fact if you fall in love with them, make a double batch and stick some in the freezer and some in the fridge. They’ll keep for 4 days in the refrigerator and a few months in the freezer. Done deal! Late to the party, but I made these two nights ago and a) the man of the house liked them (which is going some: he wants to eat fewer meat-based meals, but isn’t satisfied with anything short of a steak); and b) the spicing was dead. on. for samosa-evocation. Thank you for a great recipe. These look so good. I will be trying them soon. Love the idea of potato-as-pastry! The flavors alone make it worth it…never mind the veggie ‘inception’ situation you have created. And now I am thinking about Joseph Gordon Levitt. Thank you. Yum… I’m so hungry now. Thanks for the great idea. I love it and will try it soon! What a fun twist on samosas!! I bet these tasted amazing, that filling looks delicious! Wow that is awesome!!! Great idea thanks! Woah, you basically made a vegetarian turducken. Awesome! I love samosas, but dealing with the fussy pastry is not something I’m usually interested in. I love that this is quicker and healthier as well. Thanks so much for the recipe! What a coil spin on the samosas. I’ll be book marking these. Thanks. It sounds amazing. I want it NOW!!! These looks so beautiful!!! I can just imagine how delicious one of these bad boys tastes too. What a great idea. I try not to eat samosas too often because pastry dough has so much fat, and this solves that problem. I really miss samosas, and these look amazing!! I’ll have to try them! These look amazing & put the traditional (i.e. unhealthy) twice-baked potato I just inhaled for lunch (& dinner 2 nights ago) to shame!! I could eat sweet potatoes & Indian-inspired food every day and never tire of them. This is a perfect potato dish! 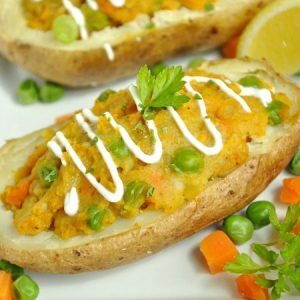 It has the best of all worlds – the crunchy white potato skin and the savory sweet potato filling. I think I may have fallen in love with this recipe. I was loking at this thinking “I don’t like white potatoes, but a sweet-on-sweet would be awesome.” And then you already had me in mind. Want this NOW! I’m starving now. Thanks for that.